Hello Lindy’s Lovers! !I have been obsessed lately with looking at my old layouts, and wondering what I would do different if I were to do the same layout today. It wasn’t hard to figure out what I would do. So, I will call this the “Rebirth of a Layout”. Just like Cinderella at the ball. I took apart my old layout layer by layer, tore off the flowers and jewels swirls, gathered some cardboard, and new white flowers, pulled out a variety of Lindys sprays, and went to town.. What a difference a spray makes! I cut a piece of 12×12 corrugated cardboard, and adhered the very bottom layer to it using ModPodge and let it dry. I sprayed the edges with C’est la vie Cerise Flat Fabio spray. While the spray was still very wet, I peeled it back from the corrugated cardboard taking the top of the cardboard layer with it, I pulled it back a bit, wrinkled the edges and let it dry. I lifted the edges of the cardstock a bit, and sprayed the exposed corrugated cardboard part with Dark Chocolate Truffle, and Cattail Copper Brown Starburst sprays. When it dried I touched it up a bit with the Ceste la vie Cerise Flat Fabio spray. The next layer of card stock is the beige one. I adhered a piece of cardboard underneath to give it depth, and adhered it to the blue layer. I used a piece of giant bubble wrap, sprayed my C’est la vie Cerise Flat Fabio spray onto a craft mat, dipped the bubble wrap in the spray, and started dabbing it onto the card stock leaving small puddles that I dried with a heat tool. I tore and curled back, and wrinkled the punched edges a bit for a worn look. Then I took the top blue cardstock layer, placed a piece of cardboard behind it and adhered it to the beige layer. I sprayed that layer with C’est la vie Cerise Flat Fabio spray and after all of the layers were dried, I gave it a quick spritz of Dark Chocolate Truffle. Then I adhered cardboard to the back of the photo, and placed it in the middle of the top layer. The next step is to rearrange all of the embellishments back onto the layout, once they were recolored with the sprays. . This flower was once white. I used Dark Chocolate Truffle, Mission Bells Brown, and Cattail Copper Brown, and dried it with the heat tool. I love the variegated look each color ended up on the flower. Here is a closeup of the layers. The layout is no longer flat with the addition of cardboard in between each layer. The richness of the browns brings out the beautiful blue. The larger flowers started out as a flat orange/ brown color. But when sprayed with Dark Chocolate Truffle, Mission Bells Brown, and Cattail Copper Brown, the depth of color comes out in each layer. I topped the flowers with Incandescent Copper Moonshadow Mist spray. All of the newer white flowers were sprayed with C’est la vie Cerise Flat Fabio spray. The white flowers that were on the original layout were also touched up with the same color. 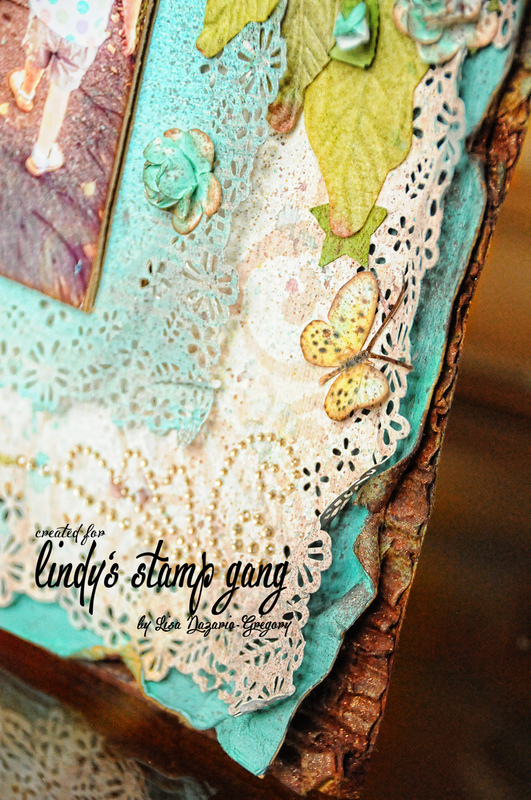 Just another closeup of the distressed layers. You can see the fine spray of Dark Chocolate Truffle that gave the layout a final touch of beautiful distress. I also sprayed some A Bit o’ Bubbly Starburst Spray to give the final layout a golden sparkle. Here are the before and after photos of the layout side by side. Lindys just added a richness to the whole layout. In real life the change is unbelievable. Thank you for joining me this week. Until next time, don’t forget to check back to the Blog often as the Lindys Designers are always an inspiration with their gorgeous art. Honestly, almost every picture I do has LSG sprays somewhere on it. They are amazing… and your rebirth of this layout is the perfect example Lisa. Your redo is FABULOUS. Such a great idea and super tutorial of the change too. Thanks bunches. j. Your newer version is gorgeous – I really like the corrugated cardboard peeking through with color – what a great idea to redo and reuse! WOW! It made a really nice difference using the LSG sprays! Wonderful idea!